Cobra is a complex group improvisation game language conceived by John Zorn in— but not of!— music; which is absolutely fun, mind-bending, physical, addictive, often psychodramatically provocative, and forever changes the way one thinks about the potentialities of group improvisation. It is normally executed by 10-14 diverse players of any stylistic background and one prompter— a director at a table of colored cards relaying requests from the players, as well as overseeing the group and instigating ideas which could only come from that omniscient perspective. I played in it with Zorn in New York and have since directed it myself hundreds of times. Over this time I have developed it further into more diverse & refined energetic and social dimensions— working interdisciplinarily and integrating influence from my research & work with languages of synergy & ritual in Africa, from improvisation practices in dance & theater, and the physicality of the language of conducting, which is my background. And after it all, had codified my own gesture system for directing improvisation. We will enter deeper into the complexities and potentialities of the language bit-by-bit each day, so that the process remains experiential & fun rather than a conceptual information overload, keeping the language flexible and organic to the participants. They shall have the opportunity to truly digest the system, thus free to think creatively & proactively with it, coming back each day prepared to use it as a tool to actualize their ideas / desires in the moment, rather than just obey it— they grow to play the game, rather than get played by the game. And dancers may take particularly well to learning & using my gesture system as an integrated aspect of their physicality (for example to run tactics on each other or to challenge the prompter via the advanced guerrilla operations). 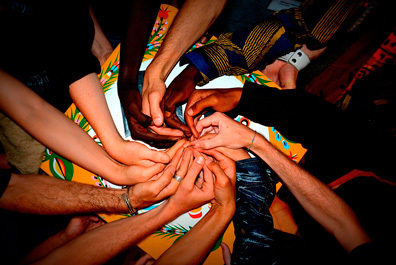 The gradual process is also essential for the diverse ensemble of performers to get acquainted with each other, to discover their creative interpersonal dynamics & subtle chemistries, frictions, and alliances which will be the foundation of their strategic tactical maneuvers in the heated fleeting moments of reaction, provocation, idea, & desire. This entire process implicitly empowers the improviser of any level to transcend any unconscious limiting notions of their own creative scope. Be welcome and look forward to a me-transcending module of confluence, eyes-wide-open communication, fluid power exchange, & swimming in interdependence... hopefully full of fascinating mistakes & unsafe successes! & dance resonate as a single art based on pulse & breath. He is a transdisciplinary conductor whose precocity and creative instincts eventually led to a rejection of academic structures and penguin suits in favor of a plurality of artistic influences. 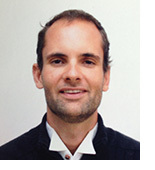 He holds orchestral conducting degrees from the conservatories of Cincinnati & Amsterdam, and dance diplomas from the Amsterdam School for New Dance Development & L'Ecole des Sables, Senegal. 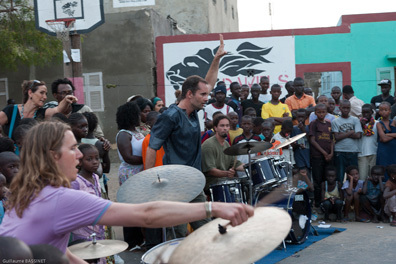 Concurrent to more than a decade of experience conducting classical & modern music ensembles in New York & Europe, and furthermore directing John Zorn's legendary game-piece of social alchemy & improvisation Cobra, Nathan created the ensemble Collision Palace in Amsterdam in 2002, specializing in the development of group improvisation languages & regularly collaborating with dance. 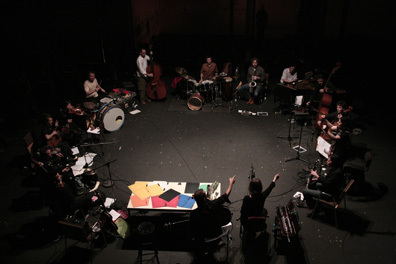 This ensemble performed in the Holland Festival with Fred Frith, premiered scores by Lee Ranaldo of Sonic Youth and Robert Ashley, and was invited by Steve Reich in The Hague Festival to realize a performance of Coming Together, in which Nathan created a system of conducting combining physical direction & vocal text performance. 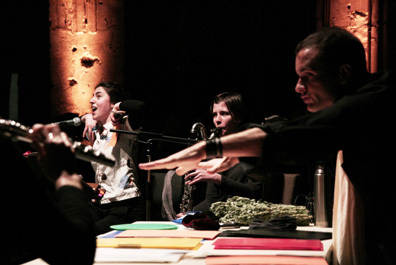 In the same period, a music theater collaboration with composer Alison Isadora spawned his creation of a conducting technique using the energetic language of Butoh dance. Center Arnhem, Institute Jacques Dalcroze Geneva, Festspielhaus Hellerau Rhythmic Institute Dresden and others. of life and universalization of healing trance, excluding no stylistic or cultural background. 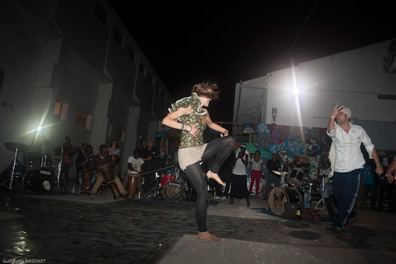 Demonshaker has been featured internationally as a workshop and performance in Oaxaca, Mexico at PRISMA Forum, and in Lisbon for UNESCO World Dance Day 2012 in collaboration with Vera Mantero/O Rumo Do Fumo and the city's best creative drummers. 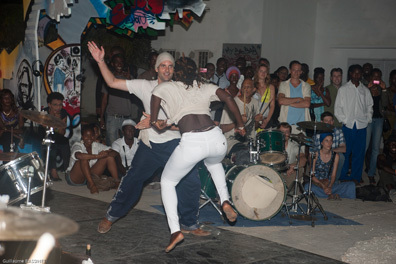 2012 the Deggi Daaj International Festival of Drumsets and Dance in Dakar, of which Nathan is the Artistic Director. 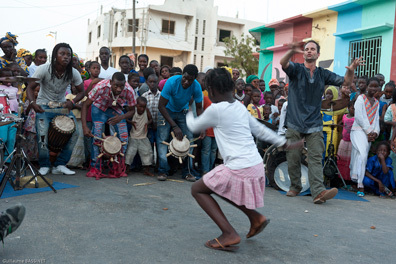 In Dakar he also directs concerts at the International School of Dakar, learns simplicity, unlearns individualism, and surfs religiously.